Comedian Mike Robles has been making Latino audiences laugh for years. The New York native rose to national prominence as host of Galavision’s Comedy Picante in the ’90s. 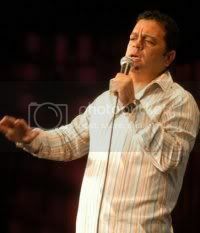 Then in the 2000s, Robles succeeded fellow comedian George Lopez as host of the Mun2 program Loco Comedy Jam. He also hosted Que Locos on Galavision. Robles is an Emmy award winner as well as nominee of two Cable Ace awards, an impressive resume given that he started his working adult life as a customer relations rep for TWA airlines. He left the gig after having to explain to a customer how her husband’s casket was accidentally flown to Hawaii instead of Hartford, Connecticut. He pursued comedy instead of therapy, which he realized isn’t too different for relieving stress. You can catch Mike Robles tonight at Cap City Comedy Club with fellow funnyman Joey Medina. The show starts at 8, but get their early. Robles recently answered some questions for Austin Vida via video cam. Check it out….